Tilt James, under jockey Russell Vicchrilli, setting the fastest time from five trials for the Mile High Futurity contested at Arapahoe Park Friday afternoon. 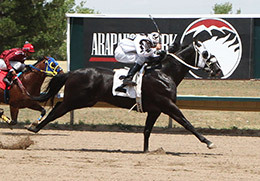 AURORA, CO�JULY 29, 2016�Multiple stakes sire IVORY JAMES dominated five trials Friday afternoon for the Mile High Futurity at Arapahoe Park. Three of his offspring qualified to the final, with two winners including fastest qualifier Tilt James. The 10 fastest qualifiers, from 37 head who started in the trials, will return to Arapahoe Park on Sunday, August 14th to vie for the winner's share of a $145,830 purse going 400 yards. Title James broke his maiden in the second trial for owners Kyle and Kelly Cook and trainer Jay Pitcher. Ridden by jockey Russell Vicchrilli, Tilt James completed the 400 yard task in :19.797 seconds, a 92 speed index with a 6 mph tailwind, to set the top qualifying mark. Geo Suthers bred Tilt James in Oklahoma from the Okey Dokey Dale mare Okey Design. The 2-year-old colt has a (5) 1-1-1 record this season and was a finalist in the Beehive Futurity and the Bitterroot Juvenile Invitational. He has earned $7,378. IVORY JAMES second finalist Rarest Ivory won the third trial to get the fifth fastest time of :19.941 seconds. Hipolito Michael-Valvrde saddled the homebred filly for owner/breeders Richard and Genevieve Herrman. Juan Pulido road the Colorado-bred to her second win in three starts. She is out of the Rare Form mare Rarest Daisy. Rocky Mountain Futurity winner Bout Tree Fiddy veered in at the break in the first trial but was still able to capture the 10th fastest time of :20.032 seconds for owners Patrick Swan and Carry Allred. Also a homebred, the IVORY JAMES gelding is trained by Tomey Swan and ridden by Russell Vicchrilli. Out of the Fredricksburg mare Hollie Jollie, Bout Tree Fiddy has won two of six starts and earned almost $69,000. For the complete list of Mile High Futurity finalists, times, sires, dams, owners, breeders, trainers and jockeys CLICK HERE.